When they are forced to work together on his company’s marketing campaign, Rekha sees a new side of Arjun, one that she finds hard to resist. While Arjun is increasingly fascinated by Rekha, having once rejected her, could he convince her that she was The One? 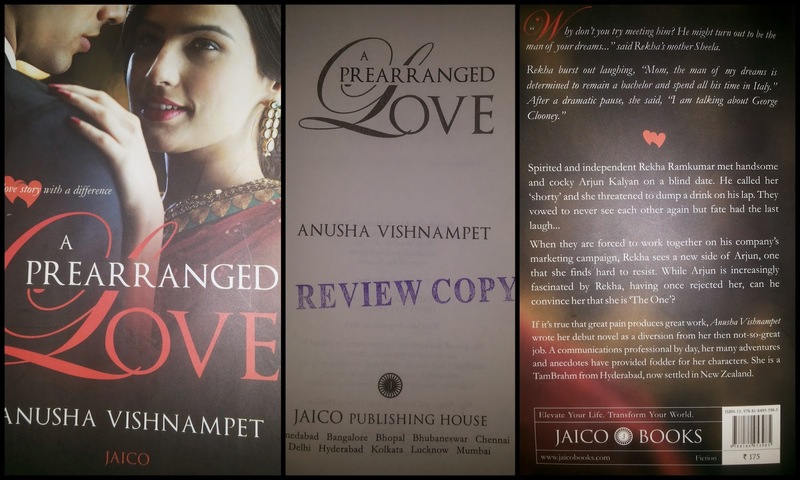 If its true that great pain produces great work, Anusha Vishnampet wrote her debut novel as a diversion from her then not-so-great job. A communications professional by day, her many adventures and anecdotes have provided fodder for her characters. She is a TamBrahm from Hyderabad, now settled in New Zealand. Rekha Ramkumar is bold, independent and holds high value about herself. She is easy-going and also matured with a smart-mouth. And, she is short with curly hair. Arjun Kalyan is smart and outspoken. He is a successful professional. And, he is tall and really handsome. The cover-page has a tall guy and a cute-looking girl. In a subtle manner, it tells us what can be expeted in the book. The book blurb is brief and to the point. It hints the readers about the plot. And then, the story…. It is the normal boy-meets-girl and then, hate-at-first-sight-blooms followed by friendship, love and finally marriage! The plot is not different or intriguing. The story is also predictable with some predictable twists and turns as promised by the book blurb. But, what makes this book an interesting read is the narrative style and the intelligent dialogs used. The story might be clichéd, but the characters are not. They seem to be too real to ignore and too smart to hate. What I really liked about this book is that the characters are very practical. There is no unnecessary whining and fooling around. Maybe because, the characters are not teenagers living in a fantasy world, but grown up professionals. The mothers of both Rekha and Arjun are very understanding who are matured enough to accept the fact that their kids are adults now! I liked the way in which the author has used dreams as means to depict the feeling and thoughst of Rekha. I also liked how Rekha calls her Scooty as Tanya. I mean most of the girls have pet names for their vehicle. And, the story unravels in Hyderabad. I wish that the author wrote about the city too. Don’t expect anything new in the plot. Also don’t expect any great work of literature. Also, the story is very predictable. It is a perky read which could cheer up your mood. A nice way to kill time. With as less as 180 pages, the book needs only as much time as a movie demands. Thanks to Jaico Publishing House for giving away this book for review.